Having lost to General Dynamics the USAF tender for a fighter aircraft, Northop resolved to offer its YF-17 prototype to the U.S. Navy. McDonnell Douglas, a company with vast experience in building carrier-borne aircraft, was invited to cooperate. In 1975 the two companies won the contest for the Navy Air Combat Fighter, this time beating General Dynamics and its naval adaptation of F-16. The aircraft which evolved from the YF-17 was designated the F/A 18 Hornet. As compared to the YF-17, the Hornet featured increased wing area, enlarged front section of the fuselage and more powerful General Electric F404-GE-400 engines. The prototype was first flown on 18th November 1978. A total of 11 machines were tested, including nine of single-seat F/A-18A version and two twin-seat F/A-18B trainers (initially designated TF-18). Carrier trials onboard USS “America” were conducted at the turn of October and November 1979. In May 1980 first Hornets were delivered to Fleet Replacement Squadron VFA-125, stationed at NAS Lemoore, California. This unit trained pilots from both U.S. Navy and U.S. Marine Corps. Overall, 410 F/A-18A/Bs were built. 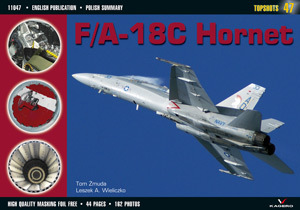 1987 saw introduction of F/A-18C, followed by F/A-18D two-seater. Both variants had provisions for carrying AIM-120 AMRAAM, AGM-65 Maverick and AGM-84 Harpoon missiles. They were also fitted with new Martin-Baker SJU-17/ A ejection seats. Beginning with early nineties of the 20th century, the aircraft is powered by F404-GE-402 engines. The twin-seater F/A-18D is no longer a trainer but an attack aircraft, used mainly for night operations. Its derivative, operated by the Marine Corps, is the F/A-18D(RC) reconnaissance version, fitted with ATARS (Advanced Tactical Airborne Reconnaissance System) in place of six-barrel M61A1 cannon. In 1992 the AN/APG-65 radars, hitherto used by the F/A-18C/D, began to phase out in favour of newer AN/APG-73 sets. 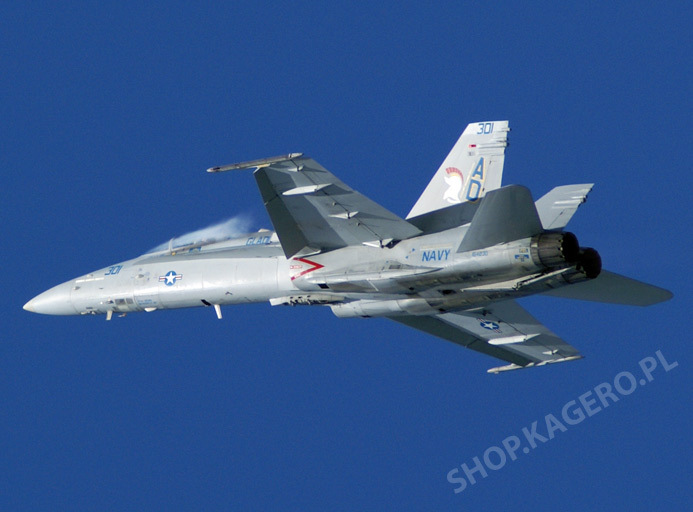 The first Hornets equipped with new radars were delivered to VFA-146 and VFA-147 squadrons in 1994. The F/A-18E and the F/A-18F Super Hornets, currently in production, are practically new designs. Despite their general resemblance in appearance, they are larger, feature several construction improvements, new F414-GE-400 powerplants and much more advanced electronics. The first Super Hornet was issued to the U.S. Navy in December 1998, and the first unit to become operational on them was VFA-115. As many as 460 machines of this type are planned to see service by 2012. Presently the F/A-18E/F variants are in the process of receiving new AN/APG-79 radar fitted with AESA (Active Electronically Scanned Array). EA-18G Growler, carrier-based electronic warfare version of the two-seat F/A-18F Super Hornet, is the latest development of the Hornet. It was designed to replace the aging Grumman EA-6B Prowlers. Hornets already saw combat in operations against Libya, Iraq (during the first war in the Gulf) and in former Yugoslavia. They remain in active service in Afghanistan and Iraq. The first foreign buyer of Hornets was Canada. Later they were also purchased by Australia, Spain, Kuwait, Switzerland, Finland, and Malaysia.